I was between 4 and 6 years old during the time we lived at Saracens and so my recollections are somewhat hazy, especially with regard to facts, but from what I recall from the times, and some later conversations with my father, the owner at the time had to go abroad for business reasons and wanted people living at the property - house sitting, I suppose it would be called nowadays. Hence we were never quite 'proper tenants' and lived in one half of the house, even though it was still one complete building , at least to begin with. At some point contractors came in and built dividing walls in the long upstairs and downstairs corridors. But the grounds were complete - I see from the website that these comprised some 28 acres -and this of course was Heaven for me. Some of the grounds were well managed, but there was no gardener living in the cottage, and I cannot recall anyone coming in to attend to the gardening, though this must have happened, at least to some of the grounds. There was a bowling green, but this had returned to nature with long grass. 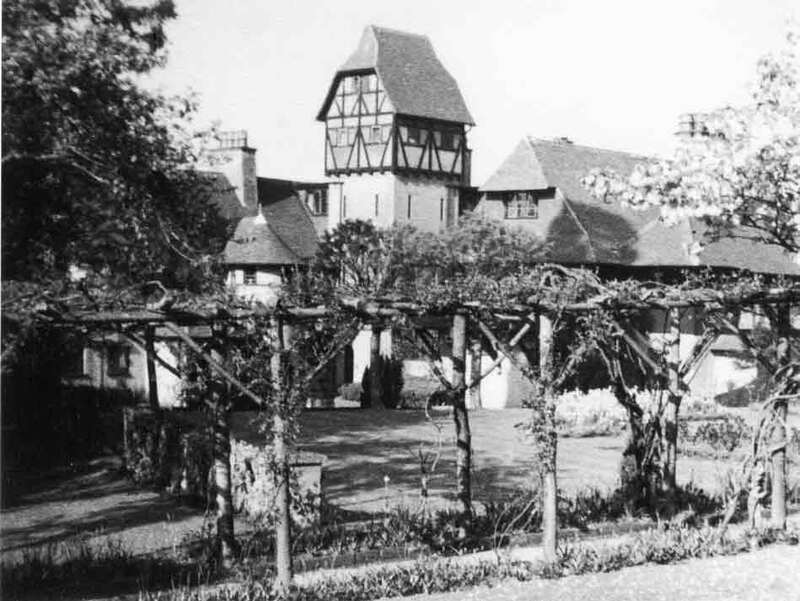 There were long pergolas - some of which are shown in the photos close to the house, but there were also others leading away from the house, and also a fruit orchard which suffered badly one Spring ('48, '49?) from a totally unseasonable snowfall that broke many branches. While I must have seen snow before then, this is my first recollection of snow. 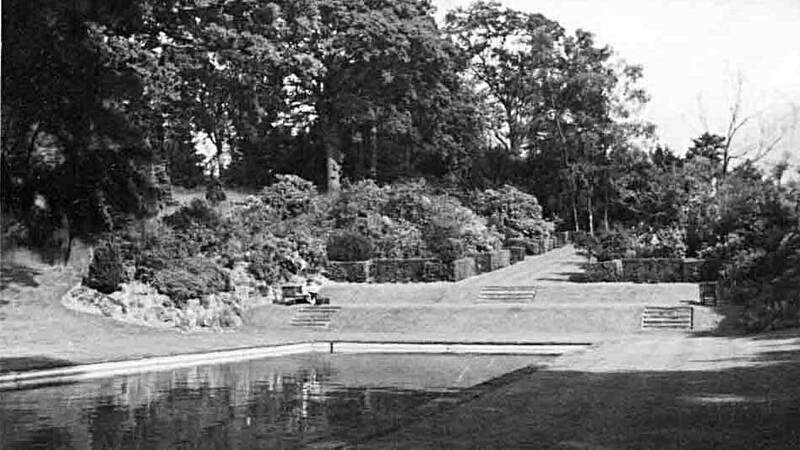 There was a lily pond, maybe 15 foot square, surrounded by York stone paving, and in turn surrounded by an ornamental yew hedge that was some six feet tall. There was a tennis court, set some way from the house in an area that was already fairly wooded. 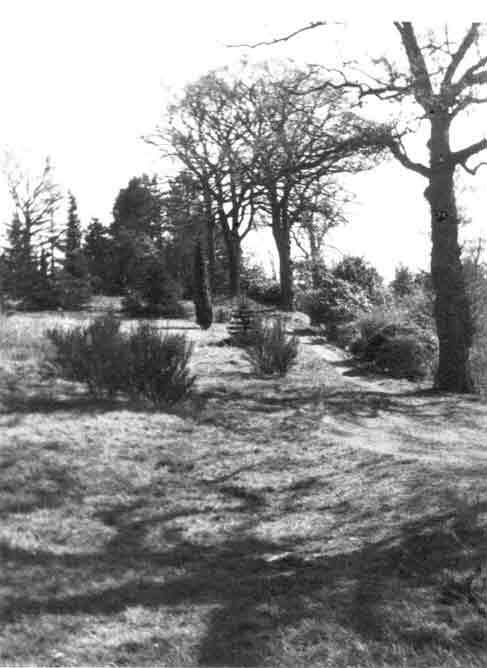 Much of the grounds were left to run wild, or at least looked so in memory, although there were several well maintained paths that lead in various directions, with wooden benches situated to catch one view or another. There was also a small-holding at one of the edges of the property, where a family lived. They had a pig-pen, with maybe half a dozen pigs, but also a hen house about the size of a barn, and a large vegetable plot. I have no idea if this was part of the land, or just abutted it. Of course, I just loved the grounds, which were densely wooded. and included a huge sequoia and what - I suspect now - must have included a careful selection of trees in the manner of wealthy Victorians. But for me it was an amazing wilderness of nature, though punctured at one point in the midst of the vegetation by a bomb crater that filled with water in the winter. The Tower, too, held a fascination for me. On the floor beneath the actual top, which was an attic room, a model railway had been built on tables running round the inside, for the old clockwork Hornby system. There was something similar in the cellar, which was huge and white tiled. The drive way to the house curved up between banks of laurel bushes, and there was a very large garage which could easily have held four cars and might have contained, above it, a small flat. The garage was built in a similar style to the house, with an odd sloping roof, somewhat between a barn and the Germanic tower. There is another memory in all of this, while important for me, will be insignificant for anyone who has not built model airplanes. My father was the inventor of the Mills Diesel engine, and whose factory was at 143 Goldsworth Road, Woking. Several of these engines were tried out with model planes in these grounds. Thus does the past hold all sorts of recollections. As L.P. Hartley put is so succinctly in the opening words of his novel The Go Between , 'the past is a foreign country, and they do things differently there'. In the Saracens of my memory they certainly did things differently. What they did within these grounds was amazing. I am so glad that I had the chance to experience, if only for a couple of years, the wildness of the place. The webmaster can be contacted on the following email address. Please retype it, as the electronic link has been removed to reduce spam.